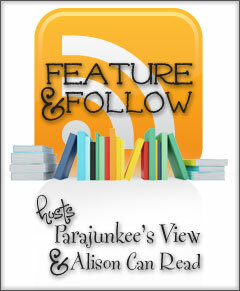 Follow Friday is a weekly meme hosted by Alison Can Read and Parajunkee. Hmmm well I have to say that there aren't many book genre's that I don't like, but I definitely avoid Horror and Thriller. Maybe not so much in the YA genre, because it's easier for me to read. But adult fiction horror and thriller books I just can't handle. I psych myself out while I'm reading them and for days (weeks) after! I am also part of the book blogger hop, hosted by Jen at Crazy For Books. The hop has changed a bit, so feel free to click the picture above for more info and to find other amazing blogs! Which genre do you avoid? Oh I was the exact same growing up! (Might still be like that) If I had a cat, would definitely would have gone through the house with me at night. Creepy! I mean really, who knows what's hiding in the dark! I can do some suspense in the thriller genre, but I can not handle the blood and guts! I just can't do it. Psych myself out to much at night time! I get so paranoid. Like have to sleep on my back so I can see EVERYTHING that's in my room so I know that there is no person/creature/other thing standing over me!